^ "Official Guinness Registry". Guinness World Records. Archived from the original on 29 May 2018. Retrieved 29 May 2018. ^ Federica Lusiardi. "Zaha Hadid's MMM Corones museum gazes at the mountains". Inexhibit. Retrieved 25 November 2015. ^ "Search for a Member; European Parliament". Europarl.europa.eu. Retrieved 20 September 2016. Cho Oyu is the sixth highest mountain in the world at 8,188 metres (26,864 ft) above sea level. Cho Oyu means "Turquoise Goddess" in Tibetan. The mountain is the westernmost major peak of the Khumbu sub-section of the Mahalangur Himalaya 20 km west of Mount Everest. The mountain stands on the China-Nepal border. Nanga Parbat, locally known as Diamer, is the ninth highest mountain in the world at 8,126 metres (26,660 ft) above sea level. Located in the Diamer District of Pakistan’s Gilgit Baltistan region, Nanga Parbat is the western anchor of the Himalayas. The name Nanga Parbat is derived from the Sanskrit words nagna and parvata which together mean "Naked Mountain". 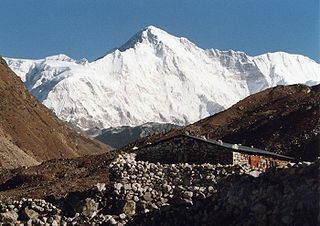 The mountain is locally known by its Tibetan name Diamer or Deo Mir, meaning "huge mountain". 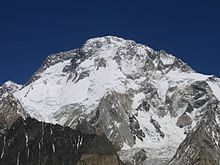 Gasherbrum I, surveyed as K5 and also known as Hidden Peak, is the 11th highest mountain in the world at 8,080 metres (26,510 ft) above sea level. It is located on the Pakistan–Chinese border and Xinjiang region of China. 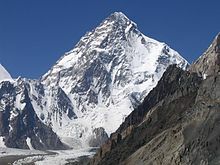 Gasherbrum I is part of the Gasherbrum massif, located in the Karakoram region of the Himalaya. Gasherbrum is often claimed to mean "Shining Wall", presumably a reference to the highly visible face of the neighboring peak Gasherbrum IV; but in fact it comes from "rgasha" (beautiful) + "brum" (mountain) in Balti, hence it actually means "beautiful mountain." 1953 First ascent of Nanga Parbat, 8,126 metres (26,660 ft). On the way back from the summit he was forced to stand erect on a rock ledge for the entire night at 8000m altitude, in order to survive until the following morning. 1957 First ascent of Broad Peak, 8,051 metres (26,414 ft). Nazir Sabir Urdu: نذیر صابر is a Pakistani mountaineer. He was born in Hunza. He has climbed Mount Everest and four of the five 8000 m peaks in Pakistan, including the world's second highest mountain K2 in 1981, Gasherbrum II 8035m, Broad Peak 8050m in 1982, and Gasherbrum I 8068m in 1992. He became the first from Pakistan to have climbed Everest on 17 May 2000 as a team member on the Mountain Madness Everest Expedition led by Christine Boskoff from the United States that also included famed Everest climber Peter Habeler of Austria and eight Canadians. Peter Habeler is an Austrian mountaineer. He was born in Mayrhofen, Austria. He developed an interest in mountain climbing at age six. Artur Hajzer was a Polish mountaineer. Hajzer climbed seven eight-thousanders, several via new routes and made the first winter climb of Annapurna on February 3, 1987. He also summited Annapurna East (8010m) via a new route up the SE face in 1988. All these climbs were done together with Jerzy Kukuczka, without supplemental oxygen or Sherpa support. Artur also attempted Lhotse South Face three times, reaching 8200 m in 1985, 8300 m in 1987 and 7200 m in 1989. He also organised a rescue operation on Mount Everest’s West Ridge for Andrzej Marciniak in 1989. On September 30, 2011, he summited Makalu with Adam Bielecki and Tomasz Wolfart. In July 2013 he died after falling in the Japanese Coloir after an attempt to reach the summit of Gasherbrum I.
Anna Czerwińska is a Polish mountaineer, known for being the oldest woman to Summit Mount Everest at the age of 50. She has also published several books about mountaineering. Karl Unterkircher was an Italian mountaineer. He is mostly known for opening new mountain routes. 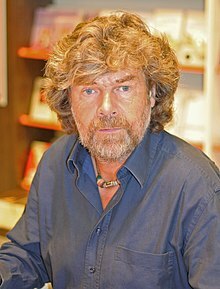 Günther Messner was an Italian mountaineer from South Tyrol and the younger brother of Reinhold Messner. Günther climbed some of the most difficult routes in the Alps during the 1960s, and joined the Nanga Parbat-Expedition in 1970 just before the beginning of the expedition due to an opening within the team. Nanga Parbat is a 2010 German motion picture mountaineering movie about two brothers, Reinhold and Günther Messner, who climbed Nanga Parbat. 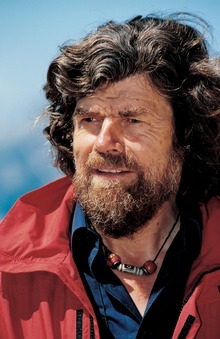 Hans Kammerlander is an Italian mountaineer. He has climbed 13 of the 14 8000m peaks. 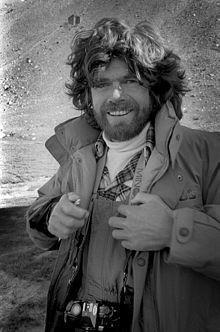 In 1984, together with Reinhold Messner he was the first climber to traverse two 8000m peaks before descending to base camp. Qudrat Ali is a Pakistani mountaineer. He is also the co-founder and instructor in Shimshal Mountaineering School, and is a member of the Alpine Club.